The health of Lemon Bay is important to us all and each month volunteers monitor the water quality at sites from Alligator Creek in Venice to Bull Bay in Placida to see that it stays that way. On the 1st Monday of each month, trained volunteers travel to one of 16 “fixed” sites (sites already predetermined) to test the water for various parameters such as pH, dissolved oxygen, salinity, etc. 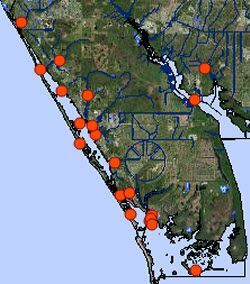 This information is collected and stored in a database with the Florida Department of Environmental Protection and is made available to many organizations and agencies to help maintain good water quality in Lemon Bay. All volunteers are trained and all equipment is provided. Most sites are land-based and no boat is necessary. All that is needed is an interest in our waters and a commitment of 1-2 hours per month. A training session for those interested in assisting in the Charlotte Harbor Estuaries Volunteer Water Quality Monitoring Network (CHEVWQMN) will be conducted at Cedar Point Environmental Park on Friday, July 27 at 10.00 am. The park is located at 2300 Placida Road, Englewood. Call (941) 475-0769 for further information.